Why buy art when you can create your own? Turn your snapshots and memories into art that is uniquely YOU with CanvasOnDemand.com. Transform your favorite photos into beautiful custom canvas prints that friends and family will adore. Your most cherished moments will be memorialized into high quality handmade wall art, creating a custom gallery worth showing off. Canvas On Demand has been crafting and perfecting photo to canvas prints since 2002 for millions of people. All canvases are created with a warp-resistant, patented, lightweight, solid constructed frame maintaining perfect corners and a polished look over time. Canvas backs are enclosed with a black matboard enclosure giving your canvas a professional appearance while also keeping dust from collecting inside. Additionally, it adds strength to the canvas construction. Pre-installed hanging hardware is included - along with a 2 year warranty - so that you can hang your canvas immediately after it arrives hassle free. Canvas On Demand makes creating your own art fun and easy. Simply upload your photos from your computer, tablet or mobile phone to get started. 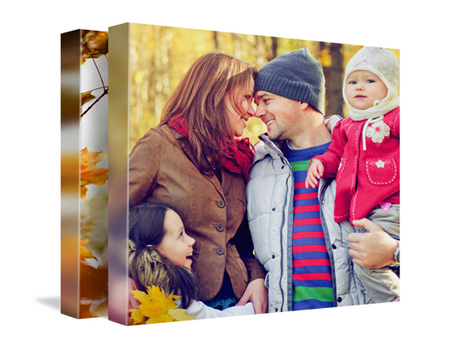 Create as many 16x20 premium canvas prints as you want. Enter the promo code CertifiKID in the shopping cart and proceed to checkout. This will apply to every 16x20 canvas that is in the shopping cart – each one will be $22. Offer is valid on unlimited 16x20 canvas prints. Use promo code CertifiKID at checkout. To Redeem: Click HERE or "GET OFFER" above and you will be redirected to Canvas On Demand to complete your purchase. Questions? Need More Information? Click HERE to contact Canvas On Demand.